A couple of months ago, it was announced that Hostess would be going out of business and shutting down or selling off its popular snack brands. At the time, I plunged head-first into a batch of homemade Twinkies after not being able to find a single package in any grocery store within 24 hours of the announcement. I was admittedly never a huge Hostess groupie growing up. First of all, I just flat-out wasn’t allowed to eat stuff like that most of the time; myy mom never kept it in our house. Second, if we were allowed the occasional treat while at the grocery store, I always navigated to the Little Debbie snacks instead (hello, Swiss Cake Rolls!). However, I did manage to get my mitts on Hostess cupcakes now and again while at birthday parties or sleepovers, and I was mesmerized by that dreamy, creamy filling, and what kid doesn’t love chocolate?! Now, after seeing multiple renditions of the homemade version online, I finally created my own. Better late than never, for sure! Needless to say, these homemade cupcakes are approximately a bazillion times better than I can ever remember those packaged cupcakes tasting. 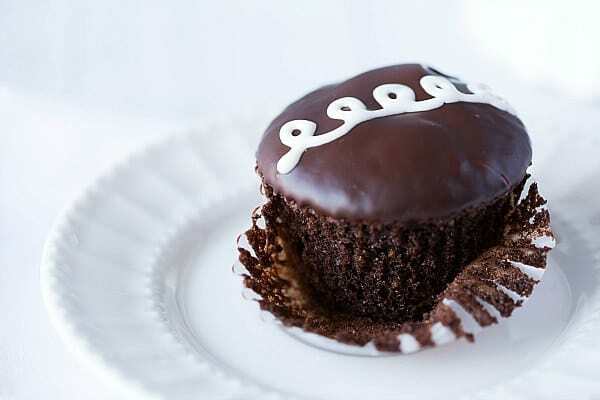 Moist, luscious chocolate cupcakes, filled with a fluffy marshmallow cream frosting, topped with chocolate ganache and garnished with the nostalgic finishing touch: white curly-cued icing. 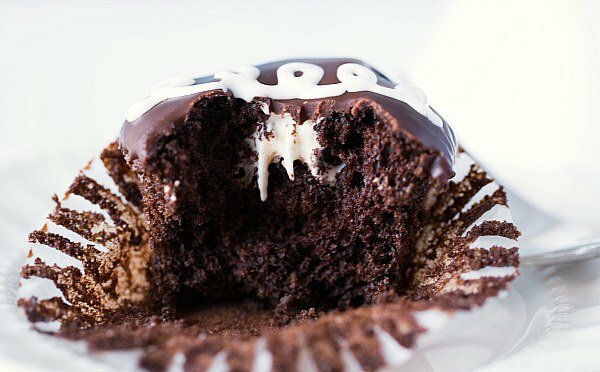 Bottom line, even if you were never a Hostess cupcake fan, you owe it to yourself to make some crazy-good cupcakes. You can even eat them for breakfast if you want and I won’t tell a soul… I’m totally on board the “eat cake for breakfast” band wagon. Anyone else want to join?! 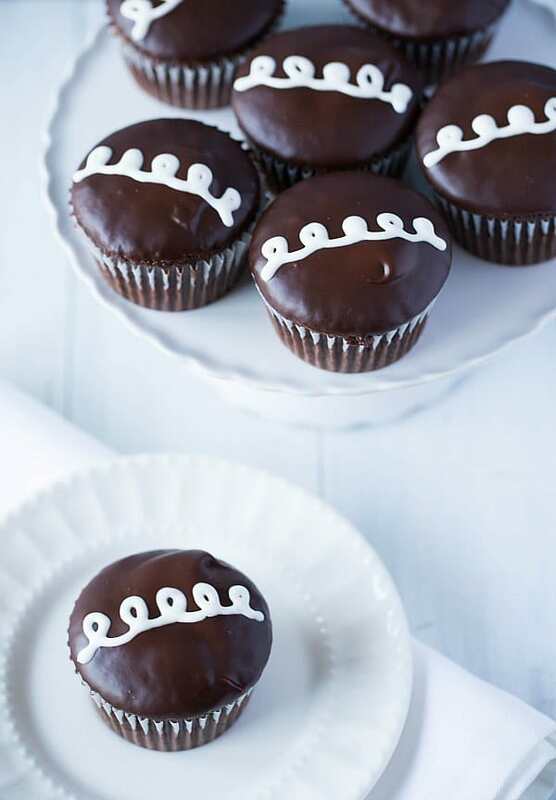 A homemade recreation of the famous Hostess Cupcakes - chocolate cupcakes with a creamy white center, topped with a chocolate glaze and white curly piping. Make the Cupcakes: Preheat oven to 350 degrees F. Line a standard 12-cup muffin tin with paper or foil liners. Place the chocolate and cocoa in a medium bowl. Pour the coffee over the mixture and let sit, covered, for 5 minutes. Whisk the mixture gently until smooth, then transfer to the refrigerator to cool completely, about 20 minutes. Whisk together the flour, sugar, baking soda and salt in a medium bowl. Whisk the oil, eggs, vinegar and vanilla extract into the cooled chocolate mixture until smooth. Add the flour mixture to the chocolate mixture and whisk until smooth. Make the Filling: Beat the marshmallow creme and butter on medium speed until soft and light, about 2 minutes. Reduce the speed to low and slowly add the powdered sugar. Once it has all been incorporated, increase the speed to medium-high and beat for an additional 1 to 2 minutes, or until very light and fluffy. Transfer the filling to a pastry bag fitted with a large, round tip (I used an Ateco #804) and refrigerate until ready to use. Make the Ganache Frosting: Place the chopped chocolate in a small bowl. Place the cream in a small saucepan and bring to a simmer over medium heat. Remove from the stove, and immediately pour over the chopped chocolate. Let stand for 2 minutes, then gently whisk together until a smooth ganache forms. Set aside to thicken for 5 to 10 minutes. 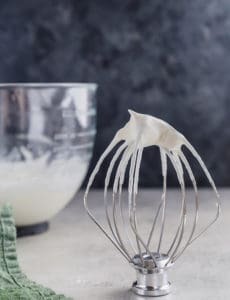 Make the White Icing: Beat together the powdered sugar, butter, milk and vanilla on medium speed until completely blended and smooth. Transfer the icing to a pastry bag fitted with a small, round tip (I used a Wilton #3) and refrigerate until ready to use. Assemble the Cupcakes: Using a 1-inch round cookie cutter (or the bottom of a large decorating tip), cut the centers out of the cooled cupcakes, going about two-thirds of the way down (just like I did in these cupcakes). Using the prepared pastry bag, pipe filling into the holes of each cupcake. If any filling spills over the top, just scrape it off so the top stays smooth. Once the ganache is firm, take your pastry bag with the white icing and pipe the decorative curls across the top of each cupcake. Allow to set for about 15 minutes before serving. Any leftover cupcakes should be stored in an airtight container in the refrigerator. this was a wonderful recipe, just the right balance of chocolate and sweetness without being too overwhelming. i will be adopting it for Gfree since I have many Gfree folks in my family and will let you know how it goes…..
My cake is delightful but my cream filling is sour. Is it okay to use all-purpose flower and chocolate chips? The cupcake part of the recipe is is IDENTICAL to the one in America’s Test Kitchen essential recipes magazine. Should they be credited on your website? Would you recommend the Hershey’s Special Dark Cocoa (a blend of natural and Dutch cocoa) or Guittard red Dutch cocoa? Have you used either one of these? Hi Shae, I’ve never used the Guittard cocoa, but I have used the Hershey’s Special Dark a long time ago. Either would be fine for this recipe. Hi, can I substitute the Dutch cocoa for natural Hershey’s cocoa powder? What is the difference? Hi Shae, You should use Dutch process, as it reacts specifically with the baking soda and vinegar in the recipe. I love these! Would this recipe work to make a full size cake? Hi Amy, I haven’t tried it! You’d want to double the recipe for a full size cake… let me know how it goes! I was weirded out that this recipe called so for little flour.. Thought I couldn’t see a number or something but did it anyways. OMG!!! 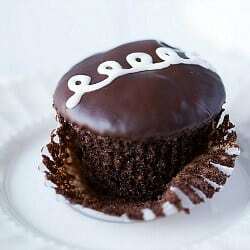 This is my to go chocolate cupcake recipe from now and forever!!!!!! Love love love it!!!! 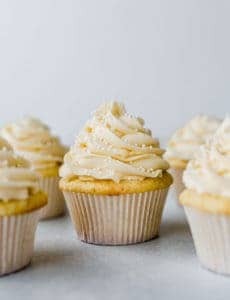 Can I use all purpose flour in place of bread flour in these cupcakes? Hi Bria, You can, but the cupcakes may turn out a little bit crumblier. You can pipe the filling into the cupcakes-I just used a large, round, serrated tip. It went super quick this way! On the other hand, I had to spread the ganache on each one. We took them 3 different places yesterday and they were a big hit everywhere! These are awesome. They are so similar to the real thing but so much better and fluffier because the are fresh. I’ve had trouble dipping the into ganache so spoon it on top and because of that have had to double the ganache recipe. I’ve made them three times and feel like I’ve finally perfected them. People LOVE them. Can these stay at room temperature? If so, how long do they keep? You could keep them at room temperature for up to 12 hours or so (say if you’re serving them for a party, you could take them out earlier in the day and leave them out), but for longer storage (i.e. days), I would keep them in the refrigerator so the topping doesn’t get too soft. I made these just for fun this past week and … wow. It was a character-building experience. Epic. But the end result was fantastic. I loved the chocolate cupcake and the ganache so much that I used them for improvised Black Forest cupcakes that I threw together for a World Cup final party this weekend. I was worried that the cherry compote might leak out but the chocolate cupcake sealed it in beautifully! I made these for Valentine’s Day for my son’s fourth grade class. I didn’t use the ganache, because I was afraid the kids’s palates wouldn’t take to the depth of the bittersweet chocolate in both the cake and the frosting. Instead I used a vanilla butter cream frosting. The kids loved them! And the parents were over the moon for them. Thanks for sharing the recipe! 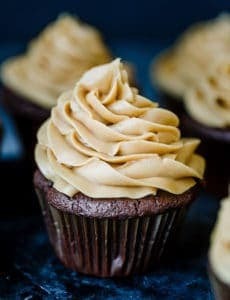 Apologies for the double post; I just wanted to add that I adore coffee in chocolate (whenever my mom makes chocolate sauce she always uses it) and to ask if powdered sugar is necessary in the frosting squiggles (I was thinking of using granulated instead)? Hi Anna, No problem! :) You do need to use the powdered sugar in the icing, as granulated sugar will not dissolve and it will be a gritty texture. I loved loved loved Hostess cupcakes when I was younger! My mom and I used to point at the squiggly icing and joke, ” Look, that cupcake has your name on it!” However, since becoming diabetic, I find they are too sweet. Thank you thank you thank you for this homemade version! One question (at least for this post): I don’t like marshmallows so is there another type of cream I might use for the filling? Thank you once again for this recipe (as well as all your others) and thank you for taking the time to read this post. Hmm…saw bread flour being used. Thought that would produce chewier and denser cake? Wouldn’t cake flour be better since this is a cake? Hi Frances, Often times cupcakes that are being filled use bread flour, since they provide a sturdier structure. Hi Melanie, Plain flour, I don’t use self-raising flour in any of my recipes.